Cycling Tip for everyone, who wants to add a bit more excitement. 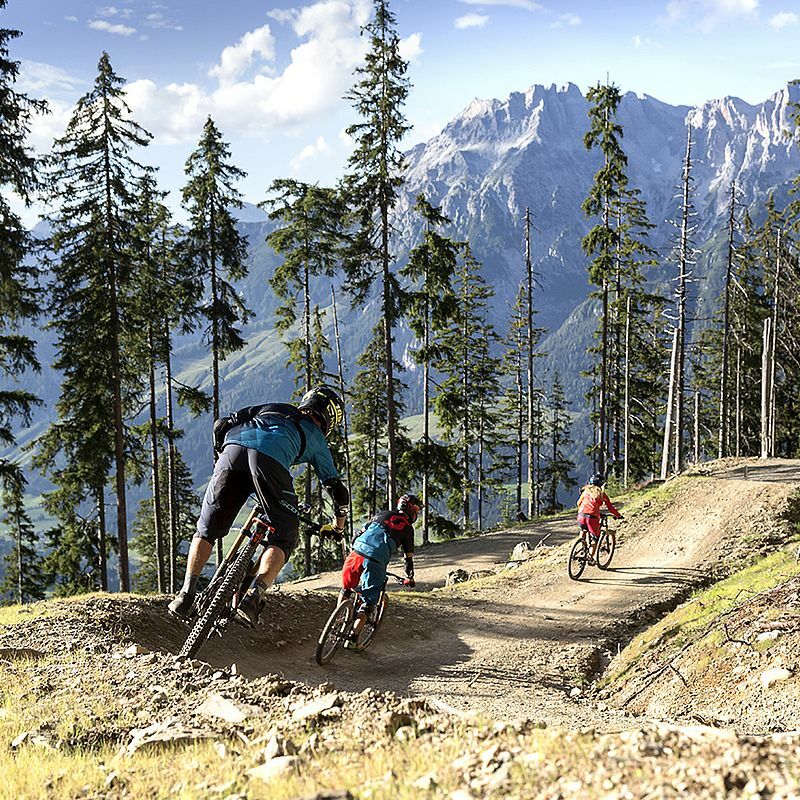 Europe’s biggest Downhill Bikepark is just 3 km away from the Hotel Der Loewe. 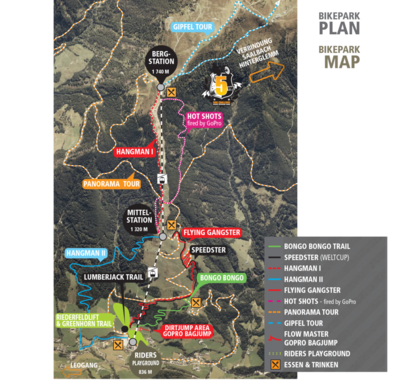 It is also a venue for international events and competitions such as the Out of Bounds Festival, the UCI Mountain Bike World Cup or the Downhill and Fourcross World Championship and the Bike Four Peaks with almost 900 participants. Do you prefer long tours without the exhaustion? With our E-bikes this is totally achievable. While you are enjoying the breakfast buffet, our e-bikes are still charging up their batteries and storing the valuable energy that will effortlessly take you to the top of all mountains and to the most beautiful places in our bike region.Lots of the alpine pastures and excursion destinations are equipped with charging stations. Whether athletically ambitious or comfortably riding with the whole family – it’s Your choice! Hotel-owned mountain bikes and e-bikes from KTM are available for € 30 per day - NEW! Fat-E-Bike rental including pick-up service in case of defects! Doubles, Kickers, WallRides, SlopeStyle - you do not know exactly what these words mean? Well your kids probably do and will feel like they simply cannot wait for your mountain bike vacation. 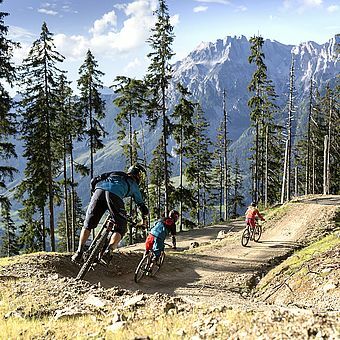 Did you know that the Bikepark Leogang is just 5 minutes from the hotel "Der Loewe"? 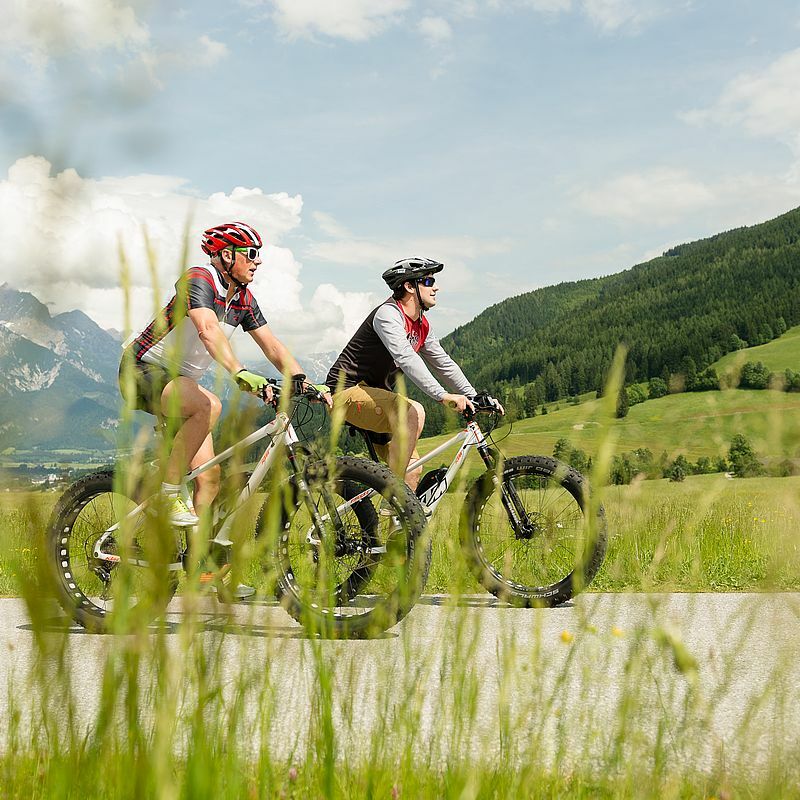 The BikeShuttle from the Hotel will make this distance seem like nothing, comfortably taking you to the valley station of the Asitz cable cars. There, your kids can show off their skills in freeride and downhill biking, and you will be amazed at what they can do in the SlopeStyleParcours, when they are basically flying over kickers and doubles, or at the SpeedRun on the World Cup downhill course of Leogang. You do not want to leave all the fun to your kids? Then off you go to the Bikepark Leogang. The bike rental by Sport Mitterer provides the best material and the experts at Bikeschool Elements will show you what is important in freeride sports. In the park and freeride camp even the downhill profi Markus Pekoll rolls in and introduces you to what you and your kids will soon be able to do too. What makes a day on the mountain bike perfect? That’s right, a little bit of everything. In the morning the cable cars will take you up the mountain. The sun shining above the clouds, while the mist is still hanging in the valley below. After the first few meters of the HangmanTrail, you already know: "This is just what I pictured!" The new EnduroBike keeps its promises. 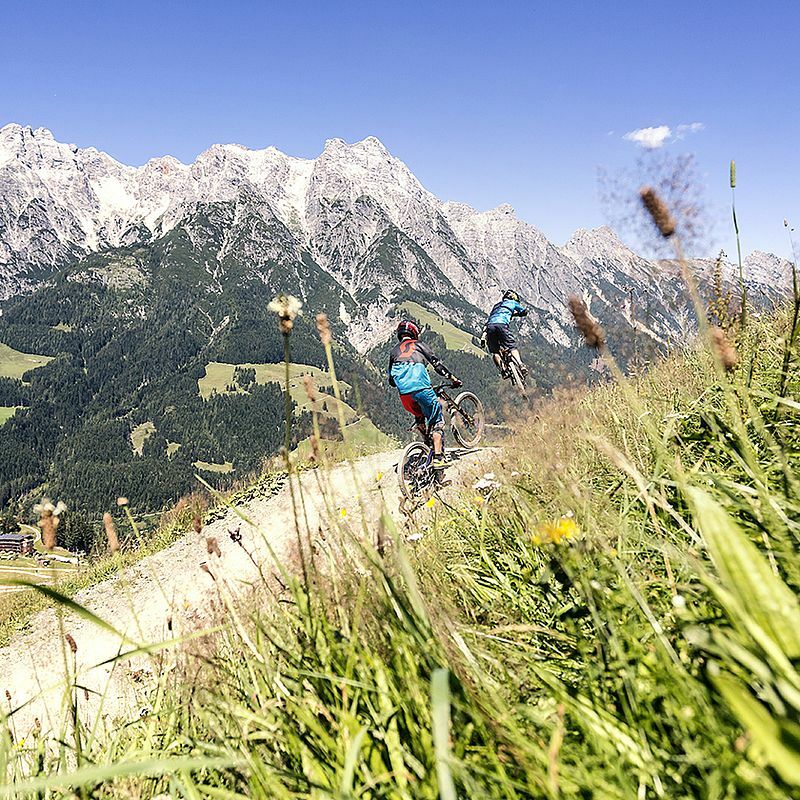 You already know all the Enduro and MountainTrails in and around Leogang? Hard to imagine since there are so many of them! After a hearty breakfast, our bike shuttle will take you to the valley station of the cable cars, where your personal Enduro adventure awaits you. Do you already know the current programs of our partner Element Outdoor Sports? Join the experts and enjoy some authentic trail classics in our region. Ever heard of the Enduro and FreerideTrials at Kitzsteinhorn? We thought so. Then the Elements Trail Safari is just the thing for you.